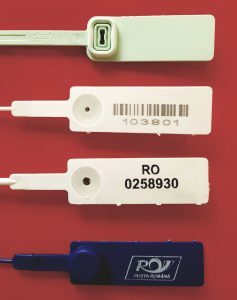 Standard personalization seals have a unique identification number and are delivered directly from our stock. Custom personalization seals have a personalized identification number and they can have your logo printed or laser engraved. Technologies for marking the security seals: the security seals can be individualized to fit the needs of the user. Typical marking includes logos, special texts, white pads for writing by hand, consecutive numbering and 1D and 2D bar codes. There are several technologies in use, including hot stamping, ink jet printing, laser engraving and thermal printing. The impact of laser marking has been more pronounced for specially designed “laserable” materials and also for some paints. These include laser-sensitive polymers and novel metal alloys.